So, maybe I'm color blind. 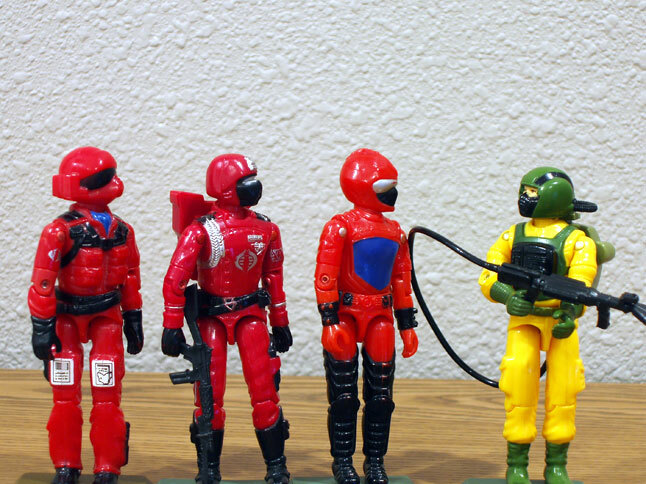 Welcome back, ladies and gentlemen, to everybody's favorite game show, "Name that Red-Suited Cobra Soldier!" Tonight we have a special...wait a second. Who...who is that...? 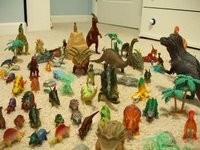 Usually, all these dinosaurs are kept in a plastic tote, safely away from the other toys. But without warning, someone tipped the tote over and there has been nothing but toy carnage for the past few days. 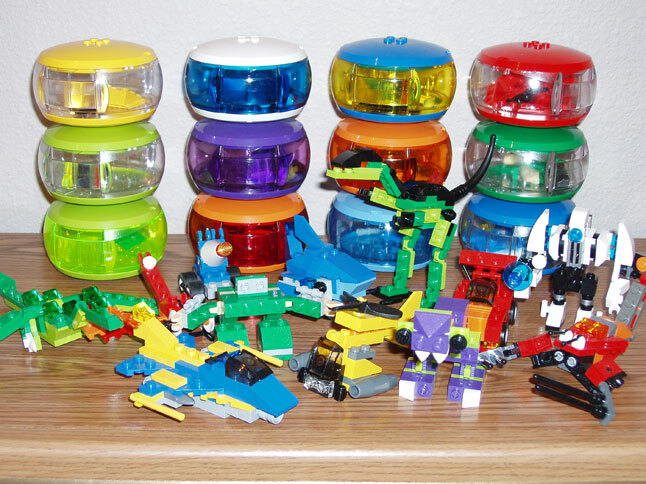 The only thing surviving are the Bionicles, since they taste mostly like burnt tinfoil. I'll have to round these beasts up soon, though. I found some eggs under my bed yesterday. 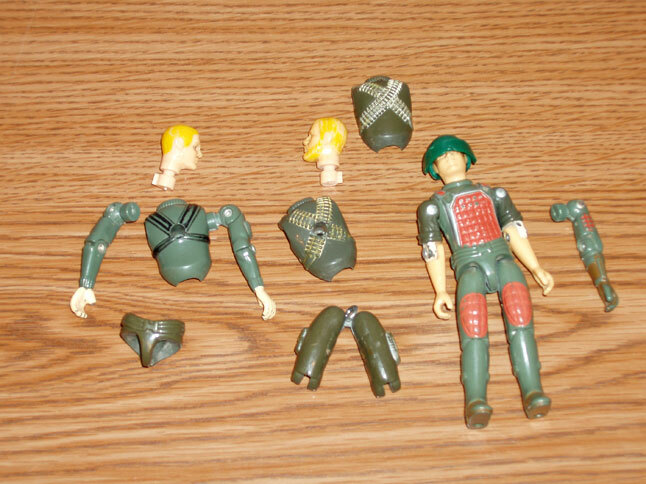 This is what's left of my brothers and my very, very, VERY first GI Joes, ever. 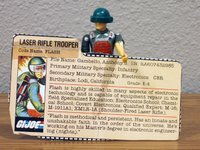 My brothers got the heavy machine gunner and the mortar launcher, and I got the Laser Trooper (Flash). Man, I was lucky! I loved that guy! 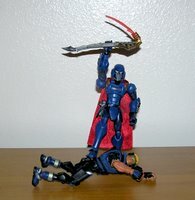 Even though this was before "swivel arm battle grip," is was one of my most favorite toys. 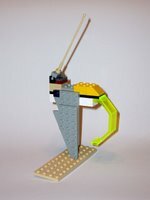 Alas, one day, one of the arms broke. (GASP!) I had to think quick. 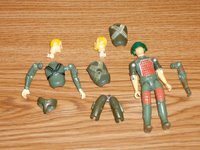 So, I took apart my brothers heavy machine gunner, took the arms, and put them on Flash. You can see one of his old arms next to him. So, you want to learn more about Flash? Well, then read his card I saved as well. 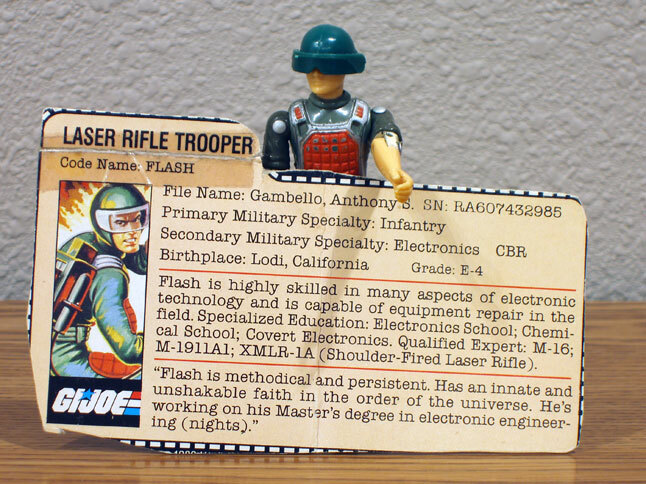 Flash, show 'em the card! 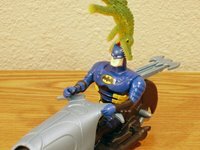 With all the different kinds of suits and armor that have been made for the Batman toy figures, it would seem to me that he should have worn his Anti-alligator Batman suit for this mission. Hey there kids! 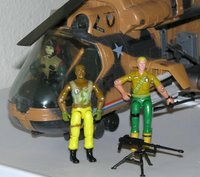 It's now time for "Guess-The-Star-Wars-Toy-Spaceship-Flown-By-A-Smuggler-And-A-Big-Hair-Dude-That-Almost-Got-Eaten-By-A-Giant-Space-Slug Game Show!" We have a really good one for you tonight! 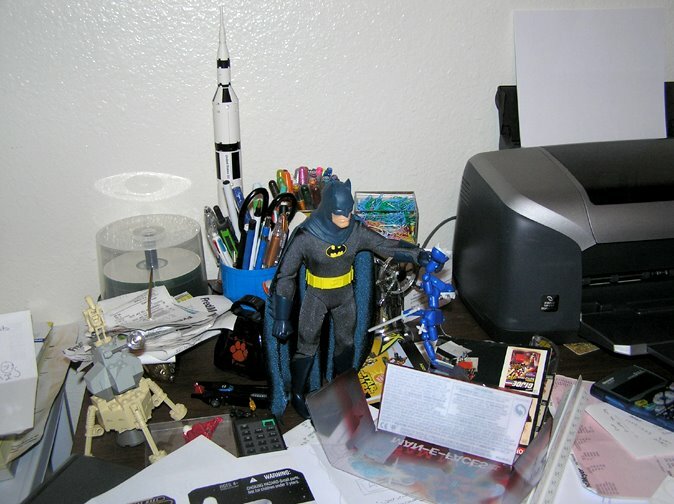 First I'll show you the close-up shots of the toy, and you try to figure out what it is. Here's a hit, the name sounds like "Gilleniun Ralcon." The Lego X-Pods are now complete in our household. (Until they come out with the next set.) 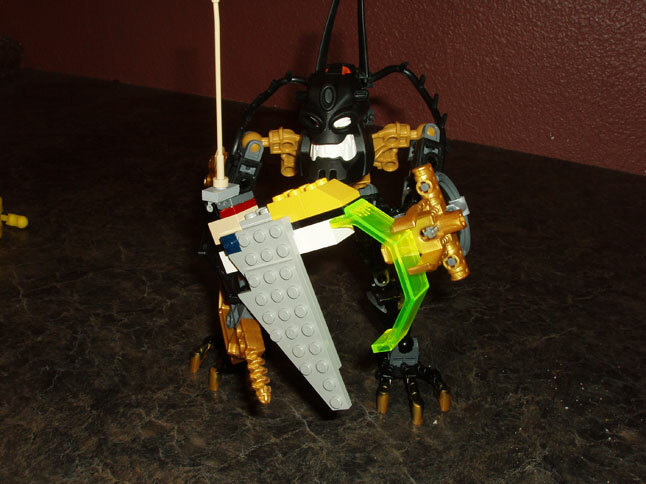 It may be me, but it seems like there are more pieces with the newer sets. But hey, that's just fine. I also recommend playing the X-Pod playoff game with them. Quite fun, if I do say so myself. It involves eating, flying, scareing, pushing, jumping, and more. Like a very interactive version of chess. Sorta. Kinda. But not really. Will the real Roadblock please stand. 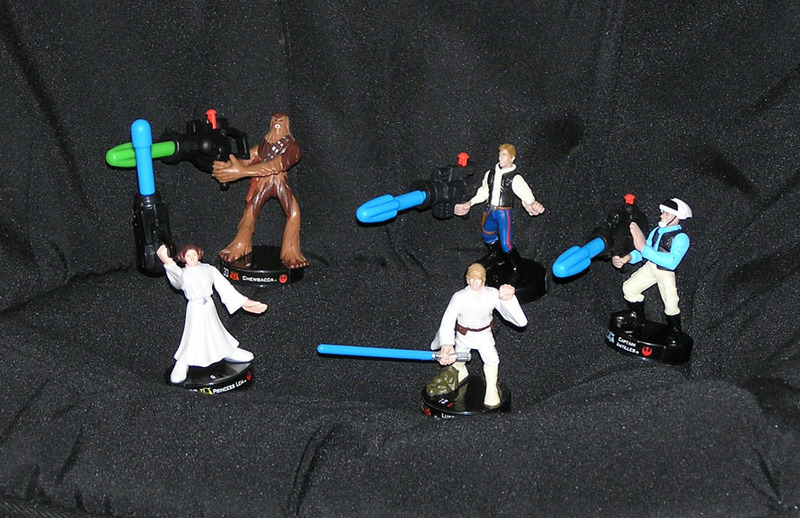 Thanks to Attacktix Joe, Joe Attacktix, I won a set of Star Wars heroes! Thanks Joe! Chewbacca wants to know why his weapon is green while everyone else sports blue. The mystery of the Star Wars Universe I guess. Since I have this set already, I think I will plan to surprise unsuspecting people into their own starter set, so I can rumble their puny talents later. Bwa-Ha-Ha! Welp I will be out and about for the next couple O'weeks. But don't go away, surprises may be a legofoot. And soon I will have proof from the State of Idaho that a toy nerd can get married to a beautifull girl. And then we will honeymoon on some nice Cobra Island somewhere. Hey!... 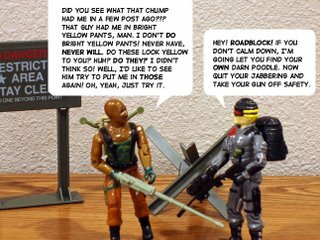 Maybe I should take my GI Joes... What's that honey? #%*Ouch! Ouch! Ok, ok, they'll stay home. 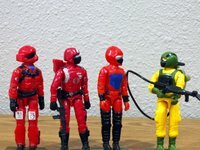 This pack of Joe's featured Duke, Roadblock, and Destro. Found it last year on clearance. 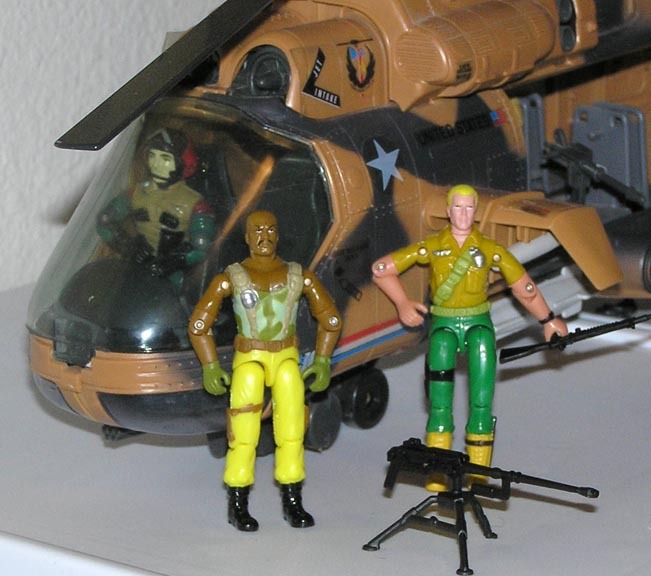 Roadblock's pants are bright yellow, and Dukes hair is about the same. Destro already took off, doing some arms deals I guess. 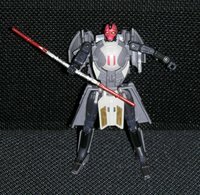 Meet my new aprentransformer. . . . Darth Maul the Sith Infiltrator! Probably the last toy bought during my bachelor life style, I picked up Darth Maul the Transfomer today. Some find these guys weird and disturbing, I kind of think they are cool. 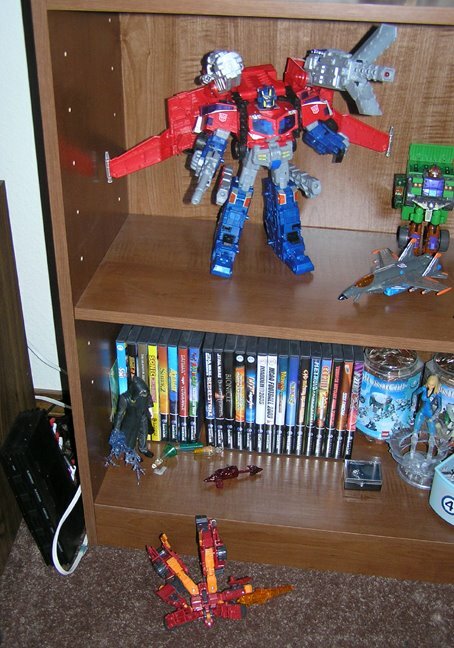 When I imagine the Star Wars universe in the shoes of Transformers I wonder how would that exactly work? Especially when the Robots themselves are still piloted by the actual character of themselves in both robot and ship. Kind of twists your brain a bit. Darth Maul here was done pretty well. Some of the robot forms come out too portly like the Jedi Starfighters or the Fett family. Other vehicles are a little revealing from certain angles like Luke Skywalker's underpants. 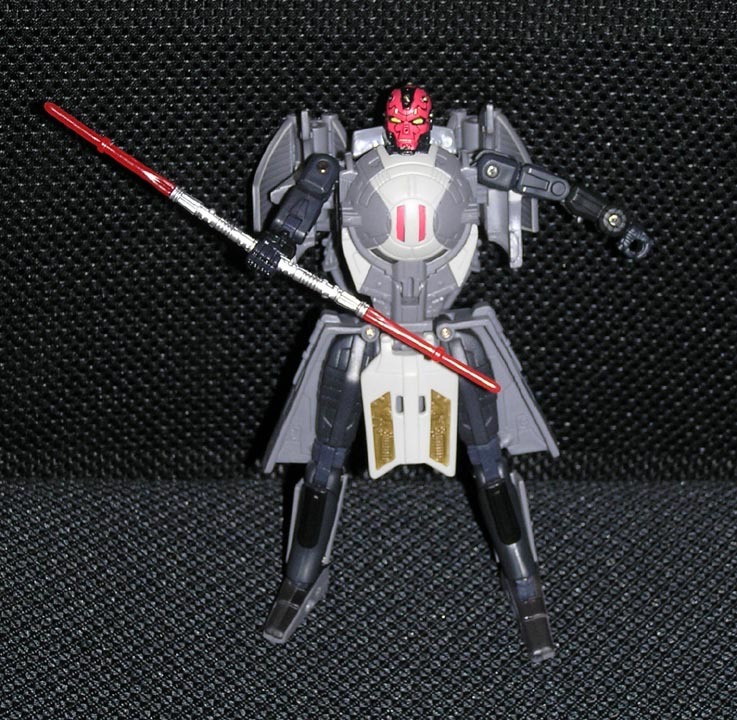 Darth Maul here has a real nice Robot form and Vehicle. Although, Maul has a strange place for tucking his hands when in vehicle form. I can't wait for the combiner Han and Chewie Millinium Falcon! 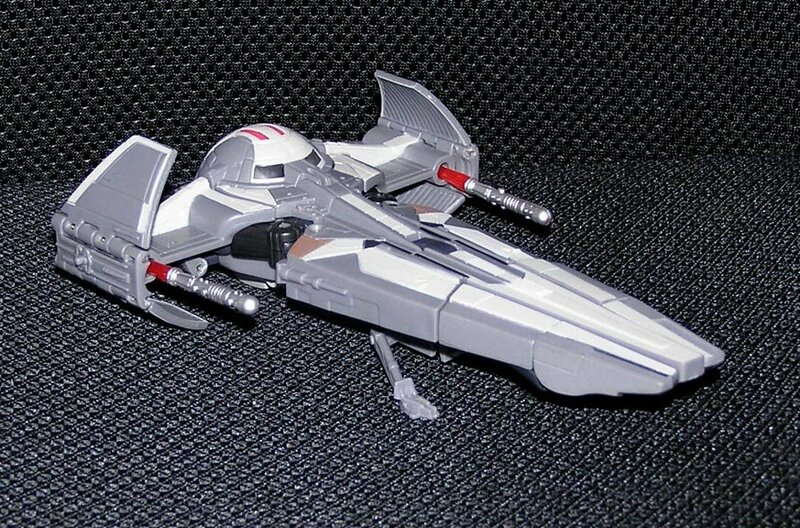 Say, can I borrow your Sith Infiltrator for a spin? 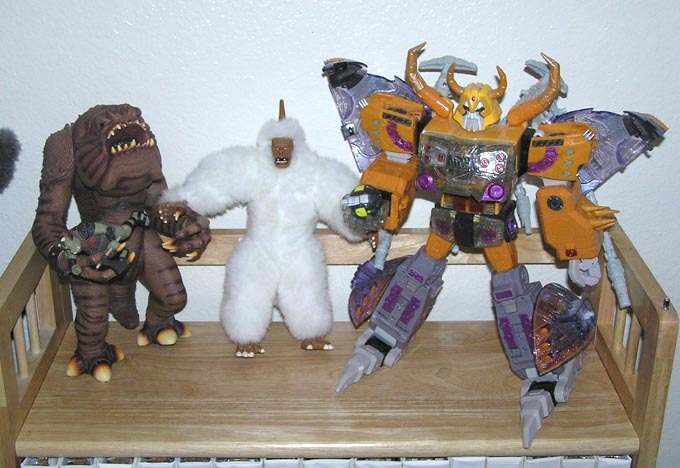 Ever since I put the Mugato between the Rancor and Unicron they have been laughing it up on a corner shelf. It has to be an inside joke, because I can't make any sence out of it. Unicron is seriously holding a spherical minicon that seems to really amuse the Rancor who is treating on a pig guard. Meanwhile Mugato is trying not to laugh. Hey Boga's back on store shelves! Thats a good thing, these big Attacktix Battle Masters make the game go crazy. I forgot to mention the total mayhem I brought to the family table on my birthday a couple months ago. 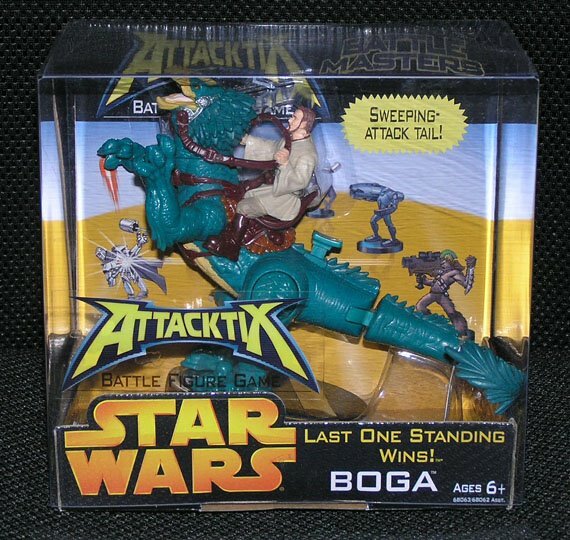 I introduced every one to Star Wars Attacktix. For some reason I thought we were going to run out of game pieces so I brought over about 50 to 75 guys. I was surprized to see them take up the whole table. 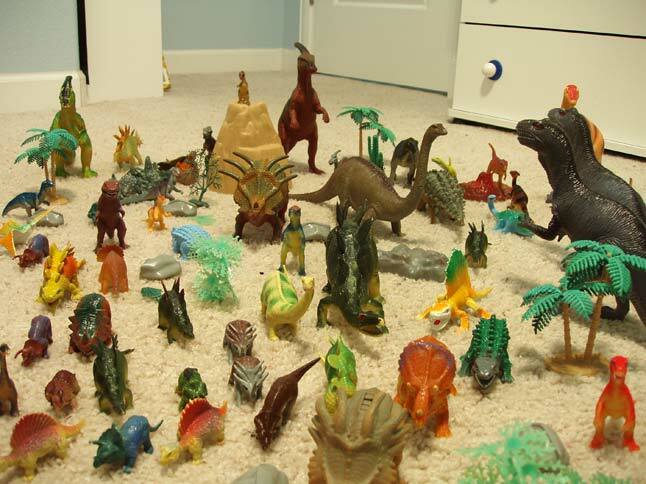 Next thing you know it a battle broke out, no rules, no boundaries! There were missles flying everywhere. Luckily none of the fine dishes were destroyed. After several attempted peace treaties and a few eye hits, we finnaly got some small 100 point games going. They went pretty well. My Grandma, who is in her late 90's mind you, got some pretty good shots with Luke Skywalker (even After he was shot down dead). Every few minutes or so, she would shoot out his force blast attack and knock down one of the in game pieces. It was great! Lessons learned though, next time less game pieces, and more controlled enviroment. And thats 201 posts! 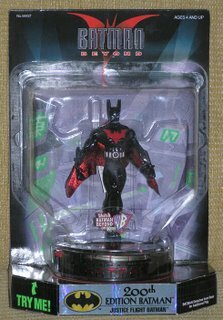 Time has flown, as does this 200th edition Batman. I think Mattel canned the idea now that they have the license. Or maybe they are at 288 or something and I will have to wait till I post 300 too. Or they will start over on their own 100th edition. That would be an interesting toy arm wrestling match. 200th post will have to wait for this cool shot from a master builder. Once again the valuable Ross family has contributed important documents to the Toy Museum. This here is a shot of the Black Piraka holding up a small scale replica of a ship I designed in my comic book universe. Very well done indeed. Thank you! Here is it by itself in the darkness of space. I guess the 200th post spectacular will be pushed back to 201st post spectacular. What to post before the 200 post spectacular? I also got home to find Rodimus dead, shot right off the shelf by none other than Optimus Prime. Something is going on between those two lately. Man, that guy is mean. 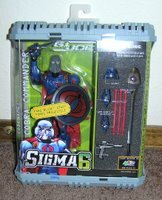 Finally found a Cobra Commander the other day. My collection now balances with three agents of Cobra vs three Sigma sixes. Hopefully I can stop now. Right out of the package Cobra Commander took out Duke. Duke swears that once he is out of his comma he will put that snake out for good.